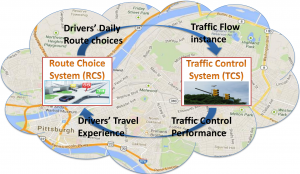 Route choice systems (RCS) and trafﬁc control systems (TCS) constitute two major approaches to mitigate congestion in urban road networks for achieving sustainable urban mobility. The interaction between signal control and route choice is often captured in the combined trafﬁc assignment and control problem, whose solution has many practical applications. We consider this interaction from a narrower RCS perspective, and focus on decentralized route guidance for operational rather than planning purposes. Our goal is to analyze the relative performance of alternative route choice models as different assumptions are made about the type of TCS in use in the urban road network. To this end, we deﬁne a uniﬁed agent-based framework for formulating different route choice models, and integrate this framework with a microscopic trafﬁc simulation environment. Within this framework, each agent’s memory is updated repeatedly (daily) to reﬂect available prior individual and social experience, and then a route is chosen by a probabilistic sequential decision-making process that is a function of the agent’s updated current memory. Several route choice models are implemented using the framework, and their performance, along with some hybrid models that are suggested by the modeling framework, is evaluated on two simulated real-world TCSs: (1) a 32-intersection road network in Pittsburgh, PA running a ﬁxed, SYNCHRO-generated coordinated signal control plan, and (2) the same road network running with the smart and scalable urban traffic control system. The results show that speciﬁc route choice models perform differentially when applied in conventional and adaptive trafﬁc signal control settings, and that better overall network performance for all route choice models is achieved in the adaptive signal control setting. Our uniﬁed framework also makes it possible to analyze the performance impact of route choice model components, and to formulate better performing hybrid models.